Although I normally cannot stand rats, Remy the rat is pretty much the cutest thing ever. And so wise! I love that little quote and try to apply it to my own daily foodie philosophy :). It was way too gorgeous outside today, which put my taste buds in the mood for something full of fresh summer flavor for dinner. In deciding what that would be, I flipped straight to the Summer Supper section of Miss Dahl’s Voluptuous Delights. I know, I know – it’s not even close to summer yet and none of the veggies used in this dish tonight are locally grown. But for one night it’s okay to pretend, right? In that case I did not spend the day frolicking through the Metroparks but rather harvesting a bounty of summer vegetables for tonight’s dinner. Sure thing. 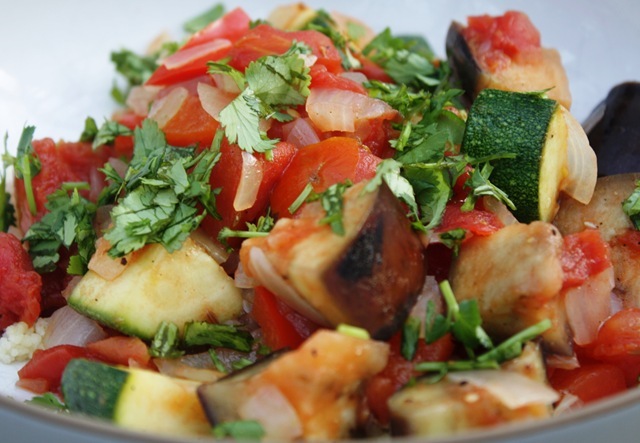 Packed full of eggplant, zucchini, bell pepper, sweet onion and tomato, sprinkled with fresh cilantro. Served over a fluffy bed of cous cous, which pairs deliciously with the spicy crushed coriander stirred into this dish. A bountiful bowl of “the good stuff”. Dig in!